Gluten-Free Macho Nachos, Crab Cakes, Corn Fritters, and more! Whether you're following a gluten-free diet yourself, or are looking to accommodate the dietary needs of family members and other guests, it's good to have a few gluten-free appetizer recipes up your sleeve. As such, we've gathered up the best, delicious recipes for appetizers without gluten, that don't sacrifice a thing when it comes to flavor and presentation. Enjoy! 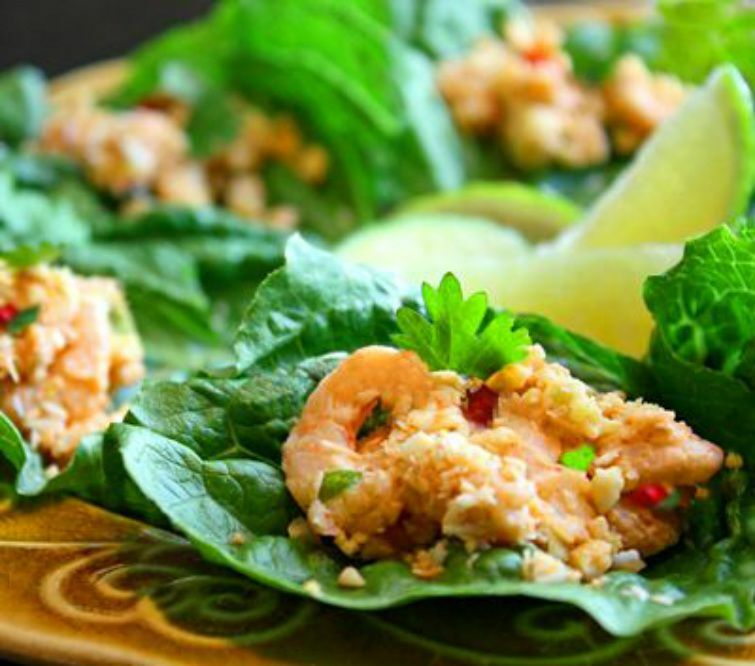 If you're looking for a deliciously different shrimp dish that's also suitable for gluten-free diets, try making up a platter of these shrimp-filled mini lettuce wraps that are bursting with delicious Thai flavors. These fresh, bite-size wraps make a perfect finger food for parties, and they taste just great with beer, as well as wine and cocktails. Stuffed mushrooms are a favorite party appetizer that are easy to eat and taste wonderful with a variety of wines and cocktails. These tasty, gluten-free appetizers have a scrumptious fresh spinach and bacon filling, that's drenched through with melted fontina cheese, making these stuffed mushrooms taste decadent. They are sure to fill you up! Do you usually avoid nachos because you're eating gluten-free? Have we got good news for you — this awesome recipe for gluten-free macho nachos is loaded with beef, cheese, and lots of veggies, but no gluten. 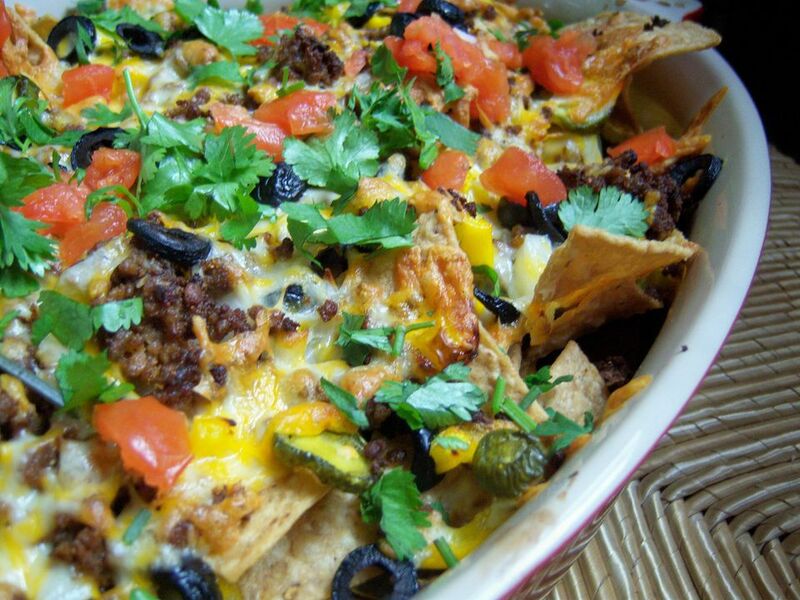 Makes a fabulous appetizer for tailgating parties, or anytime you're craving nachos. Serve with gluten-free corn tortilla chips, for the full macho nacho experience. Crab cakes are an out-of-this-world party appetizer, and make an impressive first course at dinner. You'll definitely be the hit of any party, when you show up with a tray of these favored seafood appetizers. Crushed, gluten-free crackers replace the usual bread crumbs in this genius recipe that makes simplifies crab cakes and is enjoyable for gluten-free diets. What could be easier, or more impressive, than fresh, honey-sweet figs wrapped in savory, salty strips of bacon? Fruity, meaty, and absolutely delicious, this gluten-free appetizer recipe is sure to disappear like a flash from party platters. We recommend making more than you think you need — that's how popular these yummy starters are! It's hard not to love hummus! Hummus is a high-protein, fiber-rich, typically gluten-free dip that's made from garbanzo beans (also called chickpeas). Silky smooth, flavorful, and healthy, this homemade hummus recipe is quick and easy to throw together in a food processor, and is a budget-friendly alternative to store-bought hummus. You won't need to fritter away your time to create these awesome, savory corn fritters, that take just 20 minutes to make! That's right! In less than half an hour, you can whip up a batch of this scrumptious appetizer recipe that will make everyone smile, even the kids. It's also vegetarian and is easy to make gluten-free, with tips in the recipe. Serve with your favorite store-bought dipping sauce, a homemade remoulade, or a hand crafted aioli. Fresh Thai spring rolls is a quick, vegetarian and vegan, no-cook appetizer that is surprisingly easy to make. It's a snap to make this recipe gluten-free, too, when you use rice wrappers and gluten-free tamari sauce. Crunchy, sliced fresh vegetables are combined with cooked noodles, fresh herbs, lime juice, Asian sauce, and optional ginger, in these fresh tasting rolls. Savory, saucy lentil meatballs are just as yummy as traditional meatballs, but with tons of extra nutrients. This vegan recipe for lentil meatballs is gluten-free and dairy-free, so they're a great appetizer when you're accommodating guests with different dietary needs. Mushrooms add a meaty flavor, and flax seeds add heart-healthy omega-3 essential fatty acids, to these tasty little meatballs that make a great party appetizer, served with toothpicks for spearing. Texas caviar is a classic appetizer or salad made from black-eyed peas, in a simple and spicy dressing. This vegan, vegetarian, and gluten-free version kicks it up a notch by including avocado and fresh grapefruit. With fresh cilantro, hot sauce, and just a little bit of oil in the dressing, this flavorful and colorful appetizer is also surprisingly low in fat, while providing a nice fiber and protein boost. Chicken fingers are one of children's favorite foods and this recipe is sure to become a staple in your repertoire. You'll put a huge smile on kids' faces when you serve up these simple and delicious chicken tenders, that just happen to be completely gluten-free. Baba ganoush is a roasted eggplant dip that's popular in Mediterranean and Middle Eastern cuisines. This wonderfully healthy baba ganoush recipe has a smoky depth of flavor with no oil and no tahini, making it a fat-free, vegetarian, vegan, and gluten-free appetizer or dip that you can enjoy anytime. Stuffed green peppers make a fabulous, gluten-free appetizer or lunch dish, because the ingredients are naturally gluten-free. You'll love these hearty, tasty, and satisfying stuffed bell peppers, that are jam-packed with savory ground beef, onions, cheese, tomatoes, rice, and seasonings. Make them up to two days ahead of serving for easier preparation. Here's a white bean variation on the usual chickpea hummus dip that's elegant enough to serve at parties. Like most homemade hummus recipes, it's also gluten-free, vegetarian, and vegan-friendly, making it suitable for so many different dietary needs. This cheesy, spicy, gluten-free appetizer recipe for nacho cheese dip is thickened with amaranth, unlike many store brands which are thickened with gluten. It's also seasoned with homemade gluten-free taco seasoning, so you can enjoy it guilt-free. Serve this dip warm with gluten-free tortilla chips, for a great half-time, or anytime snack.